Home » Reviews » BenQ EX3501R Review: Best 100Hz Ultrawide HDR Monitor? When it comes to gaming, for some of us geeks every inch of detail matters. And HDR makes it looks awesome. If you don’t know the difference between normal vs HDR then you can check out this video. It will give you a brief introduction about the technology and I promise you are going to love it. But there is also one downside of using HDR and that is the price point and compatibility. First of all, you need compatible hardware that is able to play HDR content. From today’s perspective, there are not a lot of displays that can play HDR content but hopefully, this is going to change soon. BenQ EX3501R Review – Best 100Hz Ultrawide HDR Monitor? Being an ultrawide monitor BenQ EX3501R looks absolutely amazing. Three sides (top, left & right) are almost bezel-less and it has a little chin at the bottom that is noticeable. But it won’t be a problem, believe me! The monitor comes with a two-color design scheme that is silver and black. The front of the monitor is completely black and the rear is mostly silver with a little black at the bottom. From the color perspective, it looks stunning. Although I prefer matte-black over any other color. But I guess that’s just me. Hit the comment if you love matte-black on gadgets. It comes with all metal V-shaped stand that can hold the monitor tightly. You also can use a VESA mount if that’s your thing. But if you are using the stand you will get a cable management hole that can hold all the connecting cables together and make your gaming setup perfect. The stand provides 120mm height with tilt adjustment of -5/+20 degrees. 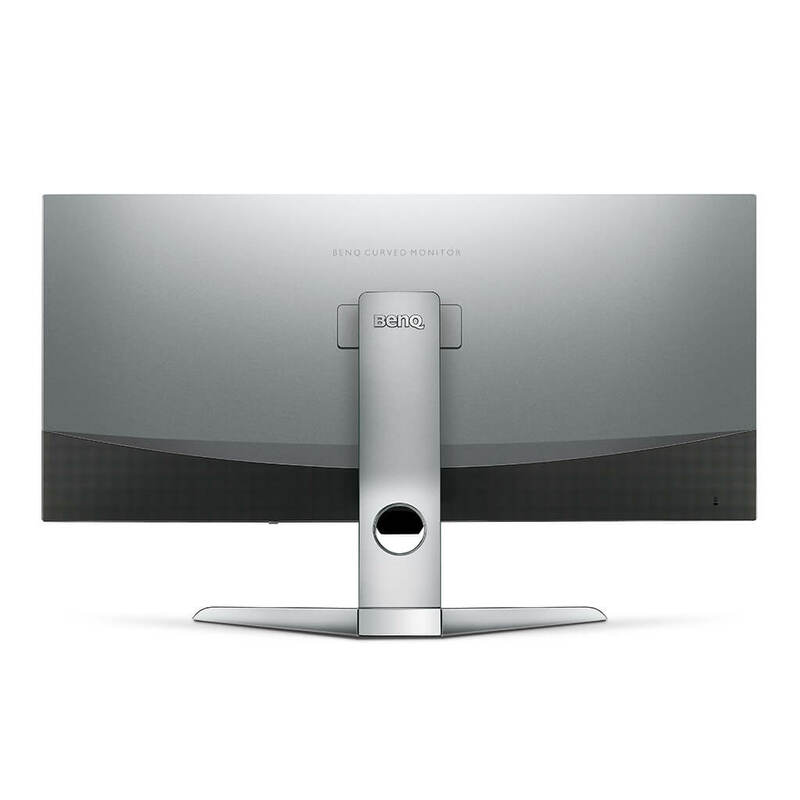 The screen on BenQ EX3501R is 21:9 wide-angle VA LED Backlight Panel. It has 3440 x 1440 i.e. 2K Resolution. The display, being so big comes with a 1800R curve that will be immersive to the user. OSD buttons are located on the bottom right of the display which may seem like a little different but anyway we will not need them every day, right? If you are looking for the physical specification of the display then I already covered it in the design section, you can check it out there. If you are buying a monitor this expensive, then the last thing that you can ignore is how good the display actually is. 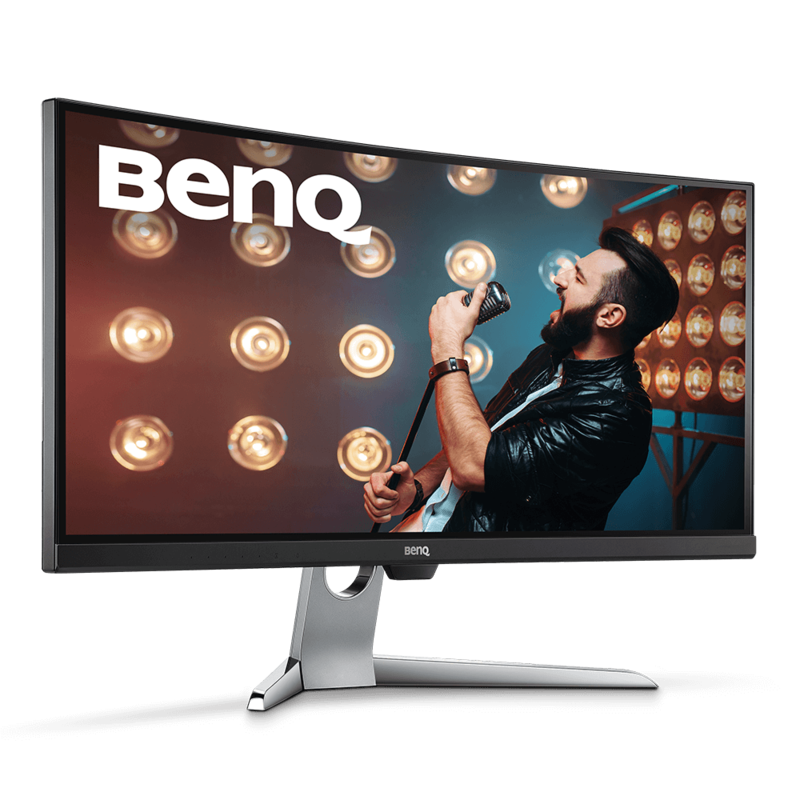 BenQ is a well-known brand when it comes to the monitors but can it compete with the rivals?. Let’s find out. Before buying this monitor I will strongly recommend you to get an AMD Graphics Card because this monitor does have AMD FreeSync and will perform at its best only with AMD Graphics card. You can use Nvidia but then you will not the best performance out of it as it does not support Nvidia G-Sync. You can see in the specs table listed previously that it has 4ms GtG response time and it may not seems like the best but the input lag is not noticeable as it has Advanced Motion Accelerator. The contrast ratio of the screen is amazing and it is able to display shadows and dark color excellently. The brightness of the display is not the best but it will do just fine. The 100Hz refresh rate is more than enough to give you a smooth performance. With the amazing resolution and wide-display, as far as the performance goes this is one of the best. There are several options and modes that can be accessed using OSD menu and you can customize the settings as per your requirement to get the best out of any display. Oh, I forgot to talk about HDR and probably that is one of the most impressive things about this monitor. If you have an HDR compatible connectivity like PS4 Pro or Xbox One X, the monitor will automatically detect it and switch to the HDR mode. HDR will provide you with bright and rich colors that will amaze you. If you are going to use HDR mode on the computer then make sure to configure it properly to take the full benefits of this technology. What is the use of a great display if it does not offer the flexibility of using different connectivity options, right? Well, that is not the case here. You get plenty of ports to keep most of your gadgets connected to the monitor at same time. For display input it has 2 x HDMI 2.0 Port + 1 x Display Port 1.4 + 1 x USB 3.0 Type-C Port. It means you can connect up to 4 devices simultaneously. Also, it has 2 x USB 3.0 Downstream ports and if a Headphone Jack that can be connected to external speakers or headphones as per the use. If you are here then you know that purchasing an ultra-wide monitor with 2K resolution will not be cheap by any means. It will come down to the fact that which monitor with the similar specifications has a good price offering. From the current price point this monitor costs marginally low then their competitors from AOC, Acer, LG etc. So this might just be a bang for your buck. Let me know if you think the same. This monitor can easily be purchased from Amazon right to your doorstep. So don’t wait anymore and grab this monitor soon! All the monitors have their ups and downs but from what I can see you cannot wrong with this monitor. You can find the complete list of what we like about this monitor and don’t in the review box. If you are interested in HDR gaming and a wide display with 1440p resolution then this is one of the affordable monitors you can get now. This monitor gets a thumbs up from us. If you have already bought this monitor or going to order it then do let us know your thoughts about it. ASUS ROG Swift PG258Q Review: Best 1080p Gaming Monitor?